KUL - frequencies increased from 7 to 11 weekly nonstop i.e. 2 class A 333 four times per week + daily 2 class A 332 effective July. DPS - frequencies increased from 4 weekly to daily flights using a 2 class A 333 routed via SIN instead of KUL with full 5th freedom rights on the SIN-DPS-SIN sector effective Jan 1st 2010. JKT - will be a nonstop terminator service flown daily using a 2 class A 332 effective Jan 1st 2010. ICN - new nonstop daily terminator flights using a 2 class A 333 three times per week + 2 class A 332 four times per week effective Feb 2010. KIX - new nonstop daily terminator flights using a 2 class A 332 effective Feb 2010. SIN - capacity reduced from daily B 773ERs to daily A 333s (2 class) effective Jan 1st 2010. LHR - capacity increased from Jan 1st to 10 weekly B 773ERs (2 class) + 13 weekly A 346s (3 class) + 4 weekly A 332s (3 class) + weekly A 333 (3 class). 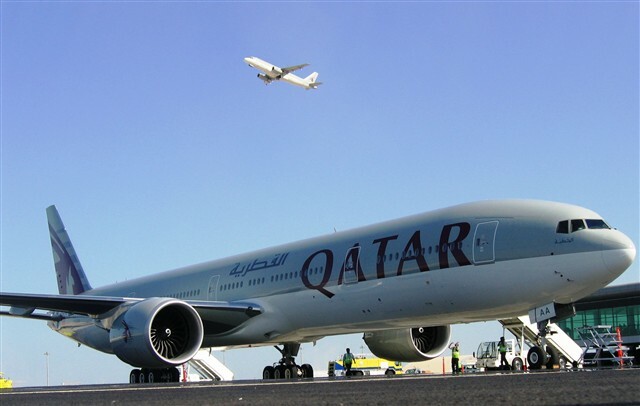 The B 773ERs will be used on QR 011/012 six times a week + 4 times a week on QR 017/018. SGN - frequencies increased from 5 weekly to daily nonstop terminator flights using a 2 class A 332 effective Feb 1st 2010. One cannot understand why QR's most loss making LHR bound flight that also sees the lowest load factors i.e. QR 017/18 would warrant a capacity increase from daily A 332s to 4 weekly B 773ERs + 3 weekly A 332s? Is it because they are hoping for some additional traffic coming in from SYD/MEL because even if that was the case it doesnt make sense as SYD-DOH + MEL-DOH is expected to connect with QR 011/012 which is rightfully so getting the capacity upgrade as well. It is however pleasing to see DPS rerouted via SIN as KUL can hold its own fort. From KUL, QR will be competing against EK's increased flights as well which will number 17 per week from Feb 2010 onwards. Putting an A 333 to DPS on a daily basis will definitely help QR further consolidate its monopoly market share position from the GCC region + from EU/UK into this niche market which is in high demand between Oct-April due to climatic variations between the Northern and Southern Hemispheres. FYI, some of you might remember that a month ago QR announced that they will be launching 2 new un-named EU destinations from this winter onwards. According to various internet posts, strong indications are that these 2 cities are Prague and Edinburgh in Scotland. SYD - frequencies reduced from 4 to 3 flights daily. BAH/RUH - frequencies increased from 5 weekly to daily flights effective August using a B 772A. FRA - frequencies reduced from 10 weekly to daily nonstop flights using a B 744. SIN - frequencies reduced from 42 to 32 weekly flights. BKK - frequencies reduced from 35 to 31 weekly flights. CDG - frequencies to be reduced from double daily to 10 weekly nonstop flights i.e. daily B 744 + 3 weekly A 343. SPK - frequencies increased from 4 weekly to daily nonstop flights using a B 744. ICN - frequencies reduced from 5 to 4 daily flights. HKG/TPE/NRT - capacity to be reduced from daily B 744 to daily A 333. HKG/BOM/DXB - capacity to be reduced from daily B 744 to daily A 333. DPS - frequencies to be increased from daily to 11 weekly flights from July. 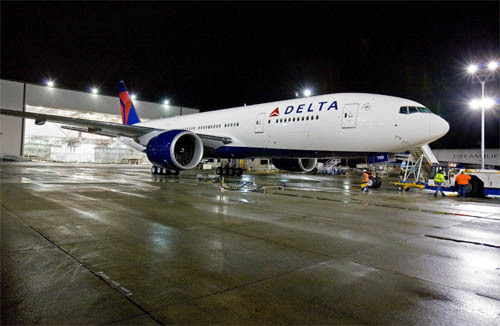 Delta Airlines has officially confirmed that it will be suspending its daily flights to KWI-Kuwait from its Atlanta hub effective June 30th 2009. It will from July onwards code share with KLM via AMS on their own AMS-KWI flight. Currently, DL flies ATL-KWI nonstop using a B 777-200ER four times a week. MUC - capacity reduced from daily B 744 to daily A 346. LAX - frequencies increased from 4 weekly to daily nonstop flights using an A 345. LHR - capacity increased from daily A 346 + daily B 744 to double daily B 744. Emirates has officially confirmed that it will be reducing its flights to Abidjan, Ivory Coast effective immediately from a daily A 343 flight operated via Accra to 4 times per week only. However, flights to ACC will remain a daily service with 3 weekly flights being flown as a terminator service. All these flights will be flown using a 3 class A 343 which is an ex Singapore Airlines version. Malaysia Airlines has revealed on the GDS that it will be reducing capacity to BOM-Mumbai, India from July onwards due to lower than fore casted demand between July-October. Currently, it flies a daily B 772ER on this sector, however from June 1st, it will be flying 6 times a week using a B 772ER + weekly A 332. MH also confirmed that it will be reducing capacity to AMS-Amsterdam from June 1st from a daily Boeing 747-400 to a daily Boeing 777-200ER. Lastly, capacity to EWR-Newark via ARN-Stockholm has been increased from 3 weekly B 772ERs to 3 weekly B 744s from June 3rd. Korean Air has officially confirmed that due to low loads and yield on the Seoul-Munich route, it is going to be suspending all of its 3 weekly flights flown to the German city from May 16th onwards. KE currently flies ICN-MUC using a 3 class A 330-200. Continental Airlines has revealed on the GDS that it will be launching its new Houston-Frankfurt route from November 2nd 2009 with a larger Boeing 767-400ER aircraft than the originally planned Boeing 767-200ER. It is expected that on the FRA-IAH sector especially, this flight will see a payload restriction in the form of cargo carrying capability. Air Canada has officially confirmed that it will be relaunching daily nonstop flights to NRT-Tokyo from its main YYZ-Toronto hub effective immediately. AC will be operating this route with its flagship Boeing 777-300ER. SAS has revealed in its annual 2008 report that it is looking to replace its fleet of Boeing 737 Classics, MD 80s and A 333s/A 343s within the next 5 years as its looks to cut costs and streamline its mainline operations out of its CPH hub. No aircraft has yet been short listed for the A 333/A 343 replacement but for the B 737/MD 80s it will be a close contest between the B 737NGs and Airbus A 320 as both variants SK has in its fleet. 1. The B 789 can easily accommodate 260 pax in a luxurious 2 class layout and fly all of its SK's current long haul and medium haul routes nonstop without a payload restriction what so ever. 2. SK will save a lot of money when it comes to engineering, cabin/cockpit crew training, rostering, maintainence etc if its long haul wide bodied fleet revolves around a single aircraft type. 3. The B 789 can carry 14 tonnes of cargo in its belly which will come in handy on SK's flights to Far East Asia in particular.